Many people suffer from tooth loss caused by tooth decay, trauma and gum disease. Some patients unfortunately are born without some permanent teeth. Missing teeth can greatly affect ones lifestyle as it reduces your confidence to smile. Missing teeth can also make eating and speaking difficult. But as people age , some cases of tooth loss cannot be prevented.A Dental implant can help with missing teeth, they have been shown to work very well in almost 95% of cases. There are few available dental implant treatments designed to replace a missing tooth. 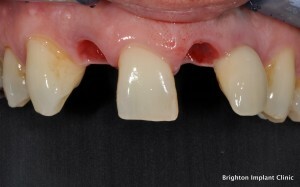 Firstly a Removable Denture is commonly used however these are usually uncomfortable and move while eating or talking. Dentures commonly cause sores and ulcers if they are ill-fitting. For this reason removable dentures tend be unpopular with patients. 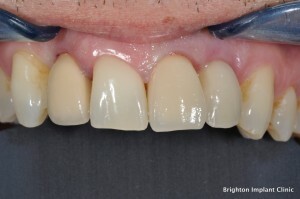 There are several million people in the UK that have removable dentures today. 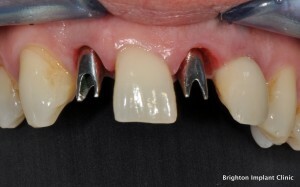 Removable dentures are usually simple and inexpensive to make. Unlike removable dentures, dental implants are stable, durable, comfortable to use and feel like natural teeth. There is no need for denture adhesives every time you eat. Denture wearers do not enjoy their food because denture movement and a decrease in taste sensation. If you are experiencing these problems, consider visiting the Brighton Implant Clinic for a FREE dental implant assessment or Call us on 0800 111 6623.